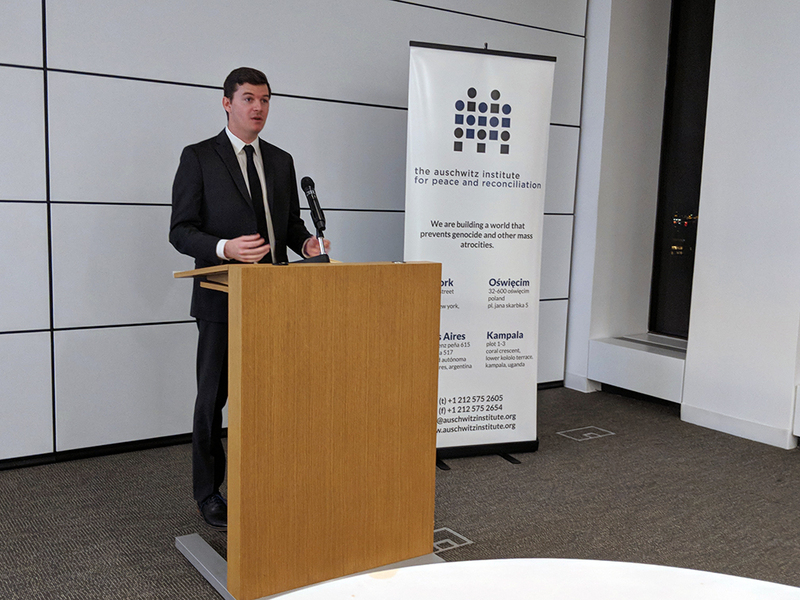 On Thursday, November 9, 2017 the Auschwitz Institute for Peace and Reconciliation (AIPR) held a launch event at the offices of White & Case LLP in New York to celebrate the publication of the third entry in its Sheri P. Rosenberg Policy Papers in Prevention series. Entitled A Shifting Paradigm: Social Media and the changing nature of conflict and conflict response, the latest addition to the series is written by Mr. Christopher McNaboe, Manager of the Syria Conflict Mapping Project at The Carter Center. The Auschwitz Institute’s Policy Papers in Prevention series, which can be found in its electronic form here, is dedicated to the memory of Ms. Sheri P. Rosenberg. In addition to serving as a member of AIPR’s Board of Directors, Ms. Rosenberg was the Director of the Benjamin N. Cardozo School of Law’s Institute in Holocaust and Human Rights as well as the Director of the Benjamin B. Ferencz Human Rights and Atrocity Prevention Clinic, both of which she had a hand in creating. 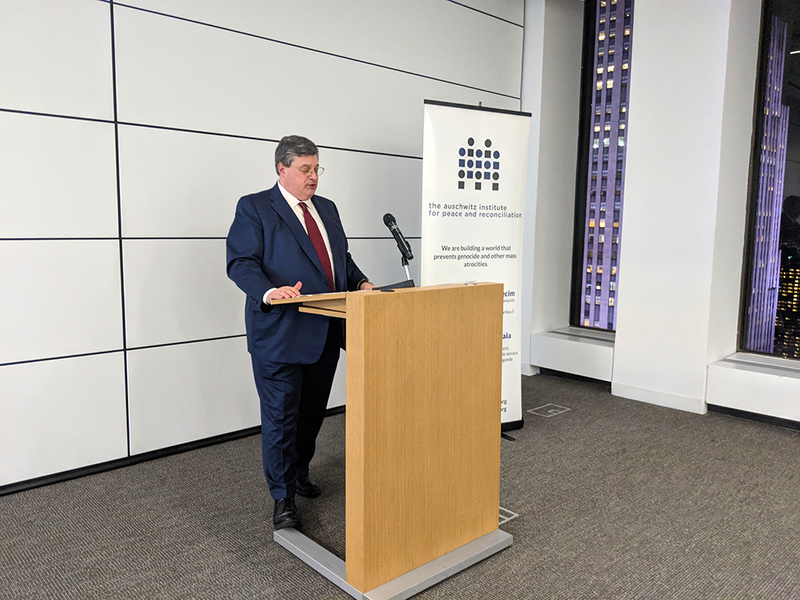 Mr. Owen Pell, AIPR Board President and Partner at White & Case, opened the event with a set of introductory remarks. He emphasized the importance of new avenues by which the innovative methods and concepts discussed in A Shifting Paradigm could enhance and support the work of actors in the field of atrocity prevention and assist in future legal efforts to prosecute perpetrators of atrocity crimes. Mr. McNaboe, the paper’s author, discussed the history of The Carter Center’s Syria Conflict Mapping Project and his role in spearheading the development of initiatives such as the interactive Front Lines Dashboard (available here). After giving an overview of the Project’s outputs and their utility related to conflict monitoring and aid efforts in Syria, Mr. McNaboe more broadly considered the impact that new technologies and social media have had on contemporary conflicts. Pointing to the myriad ways in which current conflicts are shaped by widespread social media use, he underscored the potential opportunities for these new sources of information to contribute to the prevention of atrocities and limit the rate at which ongoing violence can escalate. McNaboe also highlighted other projects at the cutting-edge of technologies that are being designed for use by citizens in conflict zones. There is an ever-expanding suite of tools, made possible by the popularization of smartphones and other portable and affordable mobile devices, that are creating new opportunities for civilian documentation of atrocities and human rights abuses. Aiding in the acquisition, processing, aggregation, and protection of potential photographic and video evidence, these technologies have the potential to dramatically increase the viability of legal efforts to fight impunity and prevent future genocide. An electronic version of A Shifting Paradigm, along with the rest AIPR’s Policy Papers in Prevention series, can be found on our Publications page in downloadable PDF format. Additional information on The Carter Center’s Syria Conflict Mapping initiative, can be found here.